Catlett won the title with his Sticky Icky Wings, an item he created while working at Fish On in Lewes, which, along with Matt's Fish Camp, is part of SoDel Concepts. Gleaming with a pineapple-soy glaze and dusted with sesame seeds and scallions, the wings are served with sriracha-ranch sauce. The recipe reflects Catlett's Korean roots. 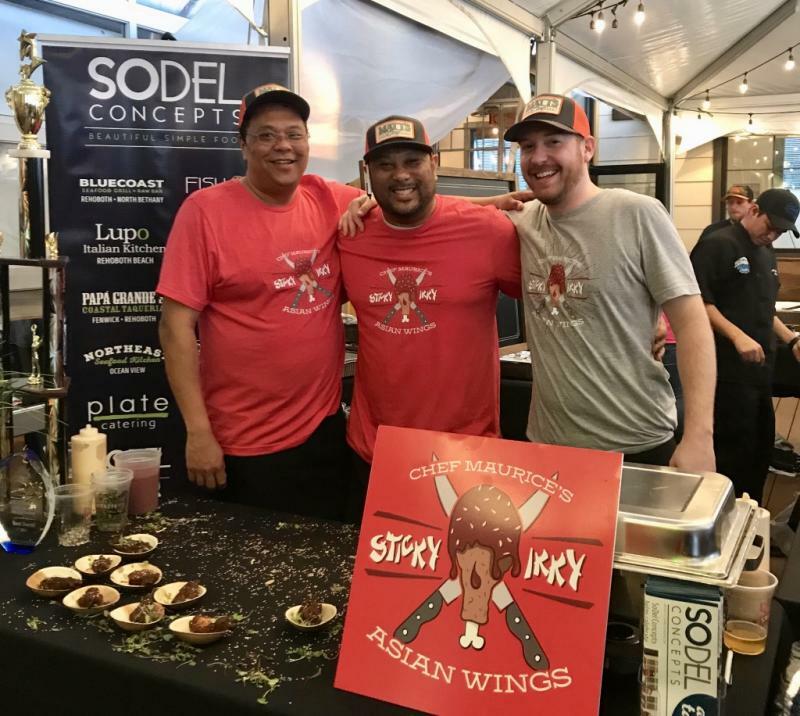 "Maurice has developed a signature style that can easily incorporate Asian ingredients into American dishes," said Doug Ruley, corporate chef of SoDel Concepts. "His food is always full of flavors and interesting twists." Catlett also draws inspiration from the South. Consider buttermilk-fried chicken and biscuits, shrimp and grits, and blackened scallops with white beans, collards and a smoked ham jus. These dishes and the Sticky Icky Wings are all available at Matt's Fish Camp. The wings are also sold at Fish On. The Best Wing on the Shore Contest, which benefits the Ocean 98.1 Cash for College Fund, lets attendees be the judges. Guests, who paid $20 per person, voted for Best Overall, Most Creative and Hottest Wing.